I'm still trying to come up with Easter ideas. It really sneaked up on me this year. If, like me, you need ideas, I have some of the food/craft/Easter hunt and basket ideas from the past couple of years below. Bunnies, Chicks, and Sprinkles...Oh My! Easter themed cake pops. Last Minute Easter Ideas: cheese puff carrot bags, jelly bean bracelets, lollipop Egg Basket. Veggie Trays. I have an example of an Easter veggie tray towards the bottom of the post. Rice Cereal Easter Treats: Egg and flower shaped rice cereal treats make the perfect snack or dessert for Easter! Hidden Surprise Pound Cake: This link is for my St. Patrick's Day themed pound cake, but substitute the shamrock for a flower or egg, and you have a great Easter treat! 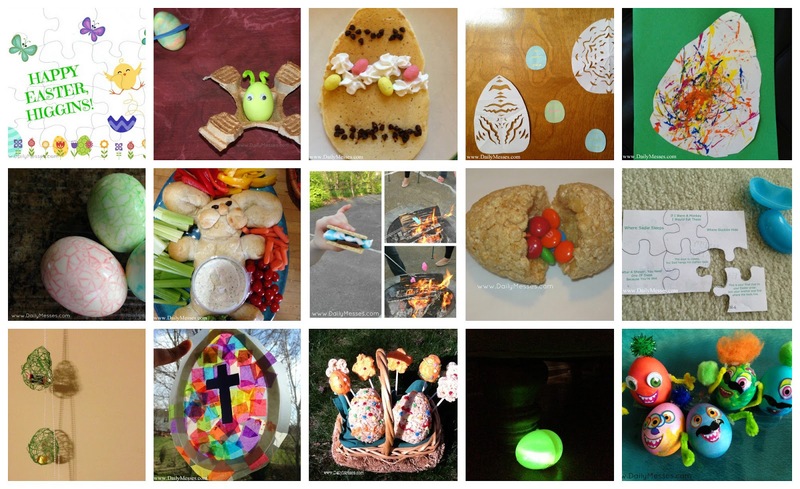 Egg Dying and Decorating:There are lots of ways to decorate eggs. However, since we like to eat ours afterwards, I am only doing ideas that leave the eggs edible. Eggs, Eggs, Everywhere...It's An Eggstravaganza! : Dying/Decorating eggs with food coloring, natural dyes, impressions, tissue paper, crayons, rubber bands, stickers, Diva Eggs, Lady Bug eggs. Drip art eggs: I want to try these this year. They look fun and pretty easy. You stand your egg upright and over something that won't get ruined like a plastic plate. Place a drop of food coloring on the top of the egg. Using a spray bottle, mist the egg. Add a drop of a different color, mist again. You can even blow on the egg to make the colors go in different directions. Try adding a drop of food color to the side of the egg too. Monster Eggs: with some glue dots, pipe cleaners, and stickers, you can create your own monster eggs! Tattoo Eggs: Last year we You can also decorate eggs using temporary tattoos. Make sure the egg is completely dry before following the tattoo directions. Ombre Eggs: Place a bottle cap on the bottom of a wide 8-10 oz glass. Set egg on the bottle cap. Mix up the dye (1 teaspoon vinegar, 40 drops food coloring, 1/2 cup boiling water). Pour dye into glass until 1/4 of the egg is covered. Let sit 5 minutes. Add plain warm water to cup until 1/2 the egg is covered. Let sit 3 minutes. Add more water to desired level. Wait 2 minutes. Repeat if want additional stripes. Carefully remove with tongs and let dry. Hunting For Easter Baskets. The boys have to find their hidden Easter baskets, so last year I left them some clues! I have ideas for your own basket scavenger hunt, as well as Easter basket fillers. Star Wars Light Saber Popsicle Molds. I cannot wait to try these...I mean to have the boys try these. Amazon sells them, as well as ThinkGeek. Reese's Giant Peanut Butter Egg. I found them at Target for $5.49, but Amazon sells some as well. Lego's: any fun looking set, mystery minifigure packs, Mixel's (Amazon, Lego). Lego usually has holiday themed sets. This year, it is a cute yellow chick. Pencils and/or pencil sharpeners, markers, stickers, stamps, activity pads, etc. I find a lot of cute (and inexpensive) items for fillers at Party City. Vouchers. I was trying to come up with some other fillers for the boys baskets. Bernardo wants to start going to garage sales to look for Lego's this spring/summer. One of his eggs is going to have a voucher for garage sale money. It could even be for an extra hour of TV, get out of 1 chore, money to spend at a store/amusement park/zoo/aquarium, etc. Mini nail polish, nail files, etc. Clay Pot Baskets. These are super easy (and cute) baskets that work great as centerpieces. Stained Glass Egg. Here are directions. They are for the pumpkin stained glass we made, so make an egg shape instead for Easter! Marble Egg. We made a marble painted craft, which is lots of fun and look neat when it's done. After the paint dries, cut out an egg shape to have a nicely decorated Easter egg! You could even cut out multiple smaller eggs to form a garland, napkin rings, etc. Bunny Basket. Easy to make bunny basket out of a paper bag.